It is relatively recently, after over twenty years of research, that I discovered that my ggggrandparents were James Donoghue and Juliana Boyle from Ballyduff; my gggrandparents were Thomas Donoghue (b.1806) and Ellen Connor (b.1808). 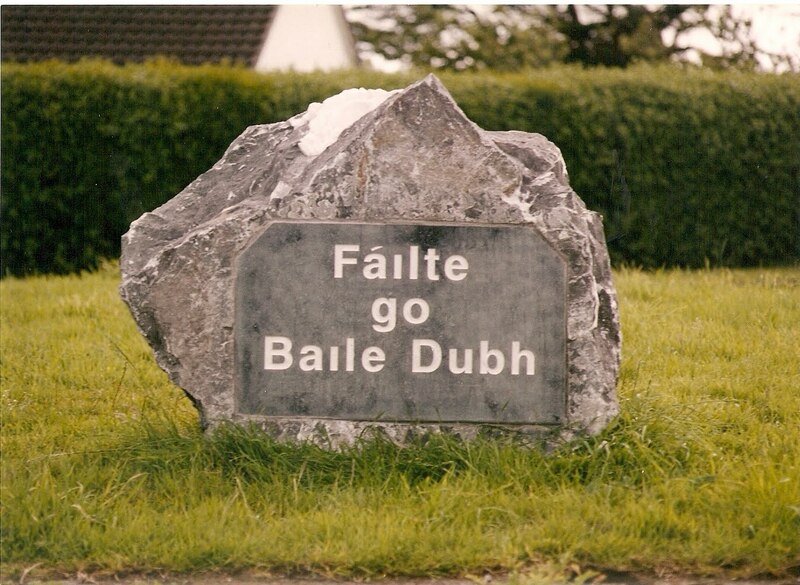 In March I spent hours pulling all the references to Donoghue, Boyle and Connor in Ballyduff and the townland in which it lies, Benmore, off the online parish records on irelandgenealogy.ie. I laid out the probable siblings for my ancestors and their related families. The earliest records are for 1782 but they are missing for 1786 to 1806. I have now learnt that the parish priest for those years had the habit of writing disparaging remarks against some of his parishioners, such as drunkard, layabout etc. When he was leaving he regretted his actions and his solution was to burn the parish register! I recorded all entries up to 1851 when Thomas and Ellen left for London. In April my sister, two sons and I set off to follow the trail. One of the pilots for a new initiative called Ireland Reaching Out was North Kerry (see http://www.northkerryreachingout.com/). I have firsthand experience of their excellent support. They introduced me to two local Ballyduff historians, one of whom spent a whole day with us and the other half a day. 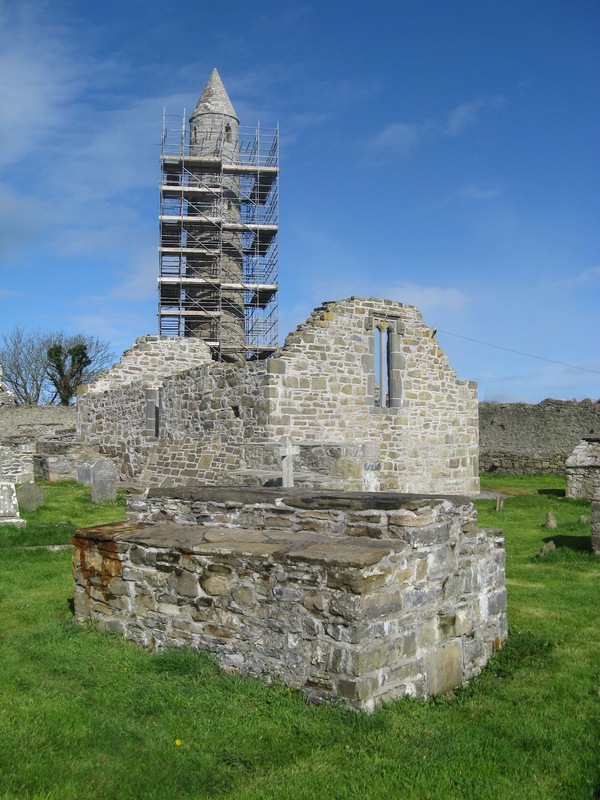 Near Ballyduff at Rattoo (Ráth Magha Tuirscit or Fort of the Northern Plains, apparently derived from an earthen fort near which the church was built) is the finest round tower in Ireland and next to it is a ruined church dated at its earliest to the ninth century. As you can see, when we visited, the tower was covered with scaffolding! Close by is an old abbey said to have been built during the reign of King John (1199-1216), but originally dating as a monastic settlement to the sixth century. The churchyard contains a number of very old tombs or mausoleums. We walked round and my sister called out that there was one which said ‘Erected by Sylvester O’Donoghue for him and his posterity 1820’. I am fairly certain that he was my ggggrandfather’s brother. The mausoleum or altar tomb was in bad repair and some patching had been done. Behind his tomb was one for which there was a later inscription for a Boyle family, with Connors round the corner. It felt right. The Griffiths Valuation for 1853 showed a Julia Donohoe living in the village. She must have been my ggggrandmother even though she would have been in her seventies. Julia’s landlord was Thomas A. Stoughton and it is probable that my farming ancestors leased their properties from him. He was an English absentee landlord with a country estate in Gloucestershire, but is said to have been a good man who looked after his tenants. In fact all three local landlords of the time, Stoughton, Gun and Rice are given a pretty good press. There are very few Donoghue or Boyle entries in the parish register after the Famine and this suggests that most of my family group left Ballyduff. Julia must have been just too old to go with them. It is possible that Thomas and Ellen’s eldest son, James, aged fifteen, stayed with her; I like to think so. In 1841 the population of the village was 331, dropping to 269 (19%) in 1851. By 1861 it was down to 214 and by 1881 it had sunk to 101. Actually Ballyduff was not as bad as many; Rattoo the civil parish within which it lies dropped by 44% between 1841 and 1851. There are many other Boyles and Connors who are clearly part of my family group but those are for later. Excellent work Rod and I am so glad you got such wonderful help from North Kerry reaching Out.